Yesterday the Government announced its latest policy on addressing the housing crisis in Auckland and increasingly in other centres, a $1 billion infrastructure fund to pay for the bulk infrastructure needed to support *some* of the new houses needed in greenfield areas. The Prime Minister today announced a new $1 billion Housing Infrastructure Fund to accelerate the supply of new housing where it’s needed most, Finance Minister Bill English and Building and Housing Minister Dr Nick Smith say. The contestable fund will be open to applications from councils in the highest growth areas – currently Christchurch, Queenstown, Tauranga, Hamilton and Auckland. Mr English says the Housing Infrastructure Fund will help bring forward the new roads and water infrastructure needed for new housing where financing is a constraint. As we know Auckland is growing at rate faster than any other region in the country – there are a few districts growing faster, such as Selwyn following the Earthquakes but they are also off a much lower base. The Q&A suggests that the high growth areas are defined as the areas expected to see a 10% growth in the 10 years to 2023. In that time frame, Stats NZ predictions suggest that Auckland will see 58% of the country’s population growth. That figure is even higher if just comparing the five areas listed with Auckland taking around 70% of that growth. As such we can expect the lion’s share of that $1 billion to be used in Auckland. Auckland’s growth over the following years doesn’t slow down either and in the 30 years to 2043 over 60% of all growth in NZ is expected in Auckland. One big issue right from the start is that for those other cities, a share of $1 billion would go a long way. But in Auckland with its infrastructure needs on another scale, it would be gulped down so fast it would barely touch the sides. The recent work that AT and the NZTA have been doing on Transport for Future Urban Growth suggests that over 30 years around $10 billion is needed in the greenfield just for transport infrastructure. On top of more funding is needed for other physical and social infrastructure that will be required to ensure these new developments have the level of amenity that will be expected/required such as parks, community facilities and much more. There is of course a lot more infrastructure that’s needed in Auckland but seems that only the greenfield stuff counts for this funding. Dr Smith says the fund will be available only for substantial new infrastructure investments that support more new housing, not to replace existing infrastructure. “To access the fund, local councils must outline how many new houses will be built, where they will be built and when they will be available. Ideally, they will have agreements with developers on these issues. Mr English says infrastructure, and its financing in particular, is one of the three key constraints to building more houses – alongside land supply and consenting requirements. Depending on the number and timing of applications, it will require the Government to temporarily borrow up to $1 billion, which will increase net debt until it is repaid. Only funding new infrastructure is kind of understandable but it does raise some questions, such as just what constitutes new infrastructure. In many cases building new roads or pipes also requires upgrading existing infrastructure to cope with the demands of new areas. We know we can’t just build tens of thousands of dwellings on the edge of town and expect the motorways to work. We also know that there are plenty of areas within the existing urban area for which replacing existing infrastructure is likely to be needed to enable new development. One such example would be the NW Busway which enables growth in existing urban areas such as Te Atatu but also will be critical in enabling growth in the entire North West. I guess that if councils can assume this fund will pay for some of the greenfield growth they would have otherwise needed to build, it enables them to re-prioritise budgets to focus their normal funding on improving existing infrastructure. One aspect I do like is the idea of linking funding to developments, the last thing we want is the council or government spending precious funds building infrastructure to an area only for a developer not to build anything and then profit off the increased land value. That of course also raises the question of why the government doesn’t just build a heap of homes themselves. Perhaps the biggest issue with this announcement is that it’s not going to have any real short term impact. Even if the funding tap was turned on tomorrow – and it seems the details are yet to be worked out – the types of infrastructure projects that this fund will help deliver are not quick things to enable. They normally take years of planning, consenting and construction before any house can be built and so it will be many years before any housing this fund enables will have any impact on our current crisis. Overall the fund seems useful but not quite as useful as the government’s headline suggest. A lot of it is going to end up coming down to the details and rules put in place and those have yet to be worked out. Ultimately the whole thing just seems like a way of loaning money to councils in a way that sits on their books differently. It will also be critical to see just what projects get built with this funding. If it just results in trying to quickly build a pile of auto-dependant sprawl that would be a terrible outcome but if it also is focuses on good quality outcomes such as decent walking, cycling and PT facilities it could be quite useful. In addition to the infrastructure fund, the government have also said they’re looking at setting up urban development authorities. Dr Smith says the Government is also considering establishing Urban Development Authorities (UDAs) to help further speed up the supply of new housing. UDAs have streamlined powers to override barriers to large-scale development, including potentially taking responsibility for planning and consenting and other powers. In some form or another we already have a few of these with the likes of Panuku Development Auckland, the Tamaki Redevelopment Company and the Hobsonville Land Company. How will a government UDA be different from these, with the possible exception of having the power to compulsory acquire land. If they did allow for compulsory acquisition it would be interesting to see if they also extended that to at least Panuku. Yes we do already have a number of organisations that are in the development planning space so indeed why does this government need to create another? I imagine it would be led by appointees rather than elected members so it smacks of jobs for the boys or more probably jobs for the boys who will follow our direction. As if CERA and ECAN hadn’t shown how much you can trust this govt not to make a bureaucratic, misled hash of appointee organisations overruling local government. Sigh. Sadly this announcement does nothing to build a lot of homes right now, it is too little too late. It is apparently for new developments only, not for existing infrastructure and as you said it is far too small an amount for a city that has far bigger problems. And Phil Twyford says the fund already exists in some form with different conditions attached. Having said that this is a vaguely long term idea that seems poorly researched. Of course this is window dressing to look like the government is doing something rather than addressing the core problems, unbridled speculation and immigration, both core National party policy. We have an urgent problem in Auckland that needs leadership NOW, not more smoke and mirrors for this governments self preservation. It won’t have any impact, ever. The core issue of rampant immigration and foreign money pushing Kiwis out has not been addressed, and until such time as it is, nothing will change. More central housing will be snapped up by foreign ‘investors’ and locals will be pushed further out. Also note this money (for what little value it will have) is simply a loan to Councils…..more debt to ratepayers. Immigration is up only because of returning kiwis, 16,000 returning from Australia alone. This is higher than NZ Firsts entire proposed quota of 10-15000. Should we stop all other immigration because of this? Or which other immigrants hould be reduced? Students, work visas, seasonal workers, pacific people? Neither developers or council could build houses without consents from council or required infrastructure being in place. This funding removes one excuse for council not building infrastructure for new development. Threats of another organisation taking over also adds a bit of stick. As per usual it’s just National doing a bare amount of tinkering to make it look like they are doing something. Too little too late. What they should be doing is saying “hey build 3-7 levels of medium-high density in approved areas (ie those with good PT) and we’ll pay $30k per unit towards the development contributions. Do the same for even taller apartment blocks”. Would bring apartment development prices down and not need as much council spend. At the same time do this $1B plan for greenfield and fund the NW busway. Agree – they probably wouldn’t even have to subsidise apartments. Rather just force councils to relax zoning so they can be developed in high demand areas? Incentivise the councils. “We will give the council 30k for every apartment they issue a consent for (to be refunded if it doesnt get built in X time period). Actually i liked david seymours suggestion on this issue: rather than subsidise housing infra, why not return gst paid on dwelling construction to councils? Then they have incentive to allow development, and revenue to fund associated infrastructure. +1 return it to local boards in Auckland too to discourage NIMBYism. Agreed Stu, not only would LG receiving construction GST incentivise Councils it could be an inducement to neighbourhoods to allow more intensification. Local government politicians could do deals in the form of asking suburbs to remove density restrictions and when the revenue from increased construction reaches a certain point the community can have some amenity -a library, light rail…… in return. Community activists could keep the Council honest by monitoring the revenue generated. Stu is surely right, remove the many barriers to brownfields and allow the market to decide; let’s not try to guess what people want, let them choose. So long as the infra costs and externalities are priced in and not unevenly subsidised, won’t this lead to a better city with more desired dwellings in desired locations? Of course that is an oversimplification in that forward planning has to happen, but there is surely a better balance to be struck here. The gst idea is good, but hard to see any gov letting go of that! Maybe Central Government needs to realise they either give real resources i.e taxes, congestion charging etc to Local Government or they take over Local Government and run everything from Wellington. As people here are saying -NZ is developing real cities, not just little market towns. Proper cities, which are complicated, dynamic, vibrant and where our future lies but these cities need support from some form of collective governance structures so they don’t become unbalanced. We have tinkered around for too long -we need joined up thinking and action on a broad policy front. They build apartments faster per capita in Tauranga which is a much smaller city than Auckland. We should follow their practices. Upgrading is different from replacement – if that is required for brownfield development I can’t see it not being included but we will see I suppose. I think the distinction between new and replacement infrastructure is more about not being able to use it for renewals. I guess that the advantage of this $1 billion dollars is that it is interest free. If I understood Len Browns comments on RNZ news this morning (it was early and there is no guarantee that I did understand what he said) , the money would be re-paid back to the Government by the Developers contribution fees. Len Browns comments where abit strange because they relate to upgrading of existing infrastructure as well. I wonder if some of the money could be used to put in new railways stations (such as Drury). It would be good if we could get electrification from Papakura to Drury at least (although all the way to Puke would be better). Would that count as new infrastructure or would that be an upgrade? I would guess that light rail down Dominion road would not count as it is not new infra-structure related to new housing areas. The example Len Brown gave was Kumeu/Huapai area but the commentator said the transport issues there were all State Highway issues and would not be able to be funded using this money. I got the feeling it is for local roads, stormwater and sewer infra-structure. I’m not really sure if any of the planned PT upgrades could be funded using this fund. But I could be wrong. Improved rail link to Helensville, Pokeno etc, start the Mt Roskill branch, start the Airport extension, anything to give better PT to allow intensification of housing. But this government would crap themselves if that was suggested. I don’t understand why limits seem to be placed on this loan on greenfields…….it should be for all infrastructure especially brownfields and public transport. Either way $1b across 5 places doesn’t go far. I guess its a movement in the right direction. GM, it is a movement in the right direction in the same way walking from Britomart to the top of Hobson St. is a movement in the right direction towards Wellington. And about as far away as is required. Councils can already borrow money. So this proposal is just another line of credit for local government -so in that sense it is nothing new. Also the sum is tiny, as Matt says. $20 billion+ will be needed for new infrastructure around the country if population growth is as great as NZ Stats predicts. The interest free component will save councils $30-40 million -not nothing but not a game changer either. And there are various conditions from Wellington which may or may not be useful on how this borrowed money can be used. P.S I have serious doubts about NZ Stats pop growth predictions -in particular that in 27 years time (one generation) NZ’s biggest city will be over 2 million while its second biggest city will be less than 3/4 of million. If that happens NZ will surely have the biggest population imbalance of any country in the world? Prediction is bound to be wrong, but in which direction? Are you suggestions get its odd to have a country’s population concentrated in one city? Well if you think of NZ as a detached Australian State, then that pattern is not unusual at all. In fact show me an Aussie State where population is not highly concentrated in its primary city… And again you could consider each main island separately and expect Chch to dominate its island as AKL does the north, seems likely, no? Ham and Tau are looking like AKL spillover towns right now, and may stutter proportionately more at the next correction. But excepting the special situation of Queenstown/Wanaka which is so driven by exogenous money on a different cycle, it’s hard to see Chch not dominating SI growth further, don’t you think? Actually what you are describing is very common, possibly even the “natural” state of affairs for unitary states. AUckland being three times the size of Christchurch as the next largest city would be wholly unremarkable. There are plenty of such examples, Paris is six times larger than Lyon or Marseille. London four times larger than greater Manchester. Lagos is three times larger than the next biggest city in Nigeria, Buenos Aires is a full ten times larger than Córdoba, the next largest city in Argentina. Bangkok is twelve times the population of Chaing Mai. The list goes on. Where you don’t see the primate city effect is in countries that are either very large in area and/or a federation in law or practice. However within the states of those countries you see it again. Sydney is ten times the size of Newcastle, Melbourne eight times the size of Geelong, in the American states you see the same effect except in the likes of California and Texas where the states are physically very large and highly populated. Conclusion, it’s totally realistic that Auckland would continue to be three times the size of Christchurch, in fact it appears to be a normal and regular outcome. Not unique or special at all, certainly not a world leading population difference. Patrick and Nick there is an argument that could be made for Auckland being like a Australian state capital. Auckland is definitely our equivalent of Sydney (and we need it to be as competitive as possible against these Aussie rivals) but is Christchurch and Wellington the equivalent of Newcastle or can they be competitive with Brisbane, Perth, Adelaide, Canberra? Sure Christchurch is the capital of the South Island, but bear in mind that only 22% of New Zealanders live in the South Island. I know you are a fan of Christchurch and it is the second city of the country, but to be frank Auckland is a whole different kettle of fish again. More New Zealanders live in Auckland than Christchurch, Wellington, Hamilton, Tauranga, Dunedin, Palmerston North, Nelson, Rotorua, Napier and Hastings put together. The only misallocation of resources would be to spend more resources where the growth isn’t happening and less in Auckland. Nick all I am saying is that it wouldn’t surprise me if Canterbury/Christchurch population growth on a percentage basis keeps up with Auckland. Of course, Auckland will remain our biggest city, it will have the biggest absolute growth numbers, I am not trying to subtly criticise Auckland. Regarding infrastructure, historically, including the decade before earthquakes -Canterbury has contributed more into the infrastructure pot than it gets back. I think there is an argument that in the decades post WW2, Auckland’s growth was underfunded and this has created some of the problems we are trying to grapple with now. Auckland clearly could have been given better transport infrastructure decades and decades ago. Given this fact and while Canterbury is still growing then I would expect some sympathy from Auckland. Surely we do not want to repeat the same mistake with another short sighted underfunded city built on the cheap (and then very expensively fixed)? 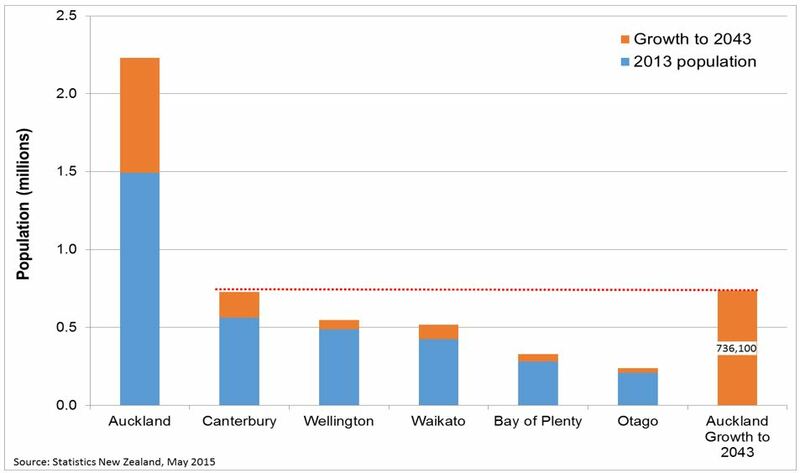 When Canterbury’s growth slows down to say Wellington growth rate then maybe I will shut up but we are building 4 times the housing in comparison to the Greater Wellington region -so that is not likely soon. Even if this does happen, Canterbury is still owed the equivalent of Transmission Gully and 100+ km of passenger rail infrastructure -trains, station, double tracking, electrification of lines just to catch up with what the other major cities in NZ have got. I think the point is that AKL and CHC are now running on very different city models. CHC is still very much a rural and regional service city but Auckland is a full blown urban services centre. So the fates of each are dependent on different forces. Auckland’s economy does appear to be increasingly detached from primary produce indicators in a way that is relatively new in NZ and is substantially different from CHC. Additionally they are developing very different forms too; CHC is now an entirely dispersed auto-dependent place; a form it already had has been exaggerated by the quake response. AKL, however, is well into a phase of recovering from that pattern, it is an auto-dependent place that is rapidly intensifying. It will be very interesting to see what happens now on in CHC, because it has replaced all its lost housing and urban commerce with edge sprawl, but will, if there is the growth, now grow back inwards as the former Red Zone land is available for development. The risk though is there may not be that growth, or perhaps it may not be strong enough. And it is important that gov and city understand that this pattern doesn’t need motorways, but Transit and Active movement and, in particular, control over parking and the urbanity of the new buildings… could go either way. Patrick I certainly agree with you regarding Christchurch urban form and it being interesting what shape it takes in the future. Correct me if I’m wrong, but I believe that all these predictions about Auckland growing by X number of Hamiltons were made when housing was a lot cheaper? It would be interesting to see the numbers around how emigration from Auckland to the regions has changed as housing costs have risen, whether it’s negligible or a factor that could have a real impact on the city’s overall growth. I wouldn’t say this is re-arranging deck chairs on the Titanic as it sinks, rather, James Cameron has already made the movie! For decades successive governments have not addressed the core issues around housing and transport. This is mere PR so the government appears that it is doing something rather than actually doing something meaningful. Arthur Grimes is bang on – the Government and opposition need to agree that they will crash the market by 40%+ just so that we can be in a position to address the over-pricing of housing long-term. It is the “recession” that New Zealand needs to have. It also shows that most MPs and commentators haven’t quite figured out yet that Auckland transition from a big town to a small city a few years ago – town solutions won’t work for a city and in fact make it worse. This means that more and more people will live in denser housing like people do in cities everywhere else in the world and use public transport as the CFN argues for; why would Auckland be any different? “The Government is offering councils a programme forcing them to incur extra debt beyond long-term plan provision, on a timetable they can’t control, when, in Auckland’s case, the council is struggling to maintain its debt at a prudent level. 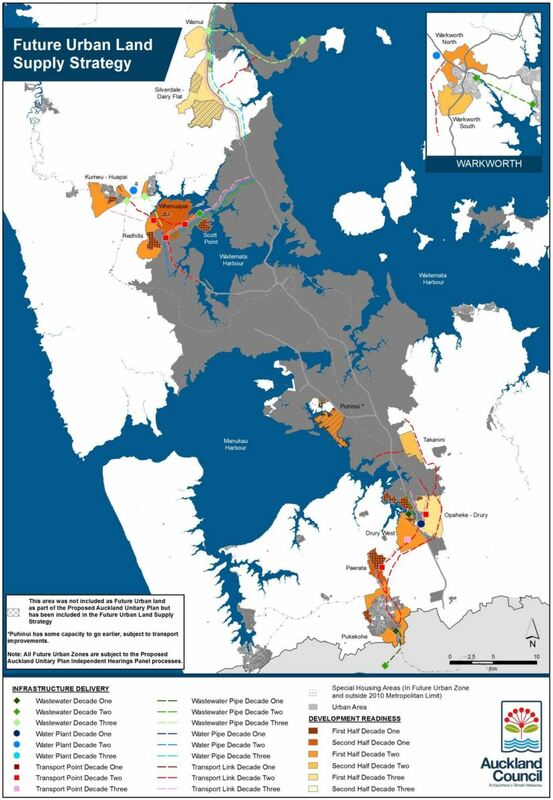 It’s a determined continuation of the Government’s intention, in Auckland, to dismantle the urban boundary and enable more greenfield development – 3 weeks before the panel which has spent 18 months hearing & working through submissions on Auckland’s first unitary plan delivers its considered recommendations to the council, including recommendations on that urban boundary”. But it is not debt funding for the councils, The Govt will own the assets until the council can amass enough development contributions to pay it back. Basically it is because Auckland Council is bumping into its debt ceiling they have created this “novel” solution. Surely a better solution is to allow the councils in high growth areas to raise their own taxes to cover the local governmental costs of growth….. But I think the purpose is to remove any excuse from the Council for not developing greenfields areas. Auckland Council agree to the accord and then used their CCO’s to stymie growth. This removes the excuse that they have no money available and allows the greenfields areas to actually develop. Sure, we can spend our half $1b on one arterial road to service growth on one edge of the city (Mill Rd) and then build the 10,000 houses that the road might be enough for, and then what? The government saying this money is only for new infrastructure but not upgrading existing infrastructure makes no sense. New powerlines, water mains and sewage pipes will be needed for the new housing estates, of course, but unless there are going to be new power stations, waterworks and sewage processing plants built alongside the new houses then all these services will have to run into and connect with existing services. Thus, the existing services will all need to be enlarged or upgraded to cope with the increased capacity demands. A group of use working on infrastructure today were pondering over this question, and we came to the same conclusion – what is wrong with Portacom type of buildings for quick and easy housing. Fully insulated, they can be transported to the site on the back of a flatbed Hiab truck and pieced together. I have worked in such a building – it was a very big building made up from several modules, but it was warm in the winter and cool in the summer, and very quiet even though it was in the middle of an industrial estate. The staff in our company was very happy to work in it for eight to 10 hours a day, and I daresay families would be happy to live in them too. Basically on the site we were working on there were rows of $600,000 to $800,000 houses being built, which very few in our work gang could afford, but looking around the site, it was littered with Portacom office blocks, which the guys said they could easily live in with their families. It worked after the second world war when the troops came back to a bombed out Britain, I remember them going in, a concrete slab poured one day and a few days later a prefab was there, said to last 10 years, people loved them and some are still in use today. we had a need then and they got on and did it, whats wrong with todays politicians, just do it, less talk more action. Oh for fucks sake: this isn’t disaster relief, just fund and build proper dwellings. How hard is it? The government used to do this. But first let’s get the regs that are restraining the private sector from the meeting the market out of the way, and fix the tax imbalances while we’re at it…. There actually hasn’t been an earthquake in Auckland, however Joyce misunderstands cities. Exactly, reform zoning and government build 10,000 homes a year until prices collapse, this is not difficult and National have done well to manipulate the media into reporting that it is a temporary problem with short term solutions. If you are living in a garage it’s disaster relief, make them relocatable. I had a look at google earth and now see your point about prefabs, were would you put them, but then how do you fix something that’s been dysfunctional for 50yrs or more and is worse now than it was when we left, (we only stayed 6 months) it was overpriced and not affordable on a working man’s wages in the late 1960s unless you moved miles out. 20km out from Manchester with a million more population and you are in the countryside and on a good rail link which is what I was comparing where I grew up with it’s farms and open fields. If it just results in trying to quickly build a pile of auto-dependant sprawl that would be a terrible outcome but if it also is focuses on good quality outcomes such as decent walking, cycling and PT facilities it could be quite useful. It will in Auckland result in sprawl, but only because the “auto-dependant sprawl” PAUP already is set. The PAUP is to open up an oversupply of sprawl in disconnected exurban locations. This $billion will not be any worse than the council plan, it just means that council will be able to create its preferred large sprawl areas with a bit more taxpayer assistance. If the fund is only eligible for greenfield development, the government is essentially sponsoring for more sprawl and congestion. The infrastructure fund should also be eligible for intensification redevelopment and transport upgrade to support it. What happens if AC decide that the conditions involved in applying for and utilising the funding aren’t worth the effort and don’t apply ? Will it be used by other locations or forced on the council ? Commonsense would dictate that an audit of existing infrastructure nationwide should be conducted. Where spare capacity is found to exist, a directive should then be issued that homes and businesses should be prioritised to those locations. Those home owners/buyers and businesses that want to locate somewhere where the infrastructure does not yet exist, should quite rightly be required to pay for it. Taxpayers and ratepayers shouldn’t have to fund new infrastructure when existing infrastructure lies underutilised. Commonsense would dictate that the stormwater capacity in Whanganui has no relevance to the demand for housing in Auckland. Sorry…you’re not describing market forces, so this govt won’t be interested. For example: “Consciously assess the situation and take effective action to address it” One may as well be speaking Swedish or Urdu talking like that around National MPs. The PM has basically said he doesn’t want to do anything that would mean even the last guy in loses equity. That’s how serious he is about sorting out the housing market. Disgusting. And we wonder why people treat the housing market as a one way bet. We can all debate the technical side of how to produce affordable housing. It is good we have a robust conversation about this important topic on websites such as this one. But why we have a conversation really comes down to a moral judgement. It is the value judgement of who wins and who loses in our society. Who gets protected by the government and who doesn’t. The PM is in a situation where if house prices fall significantly by 40% he is reassured by the Reserve Bank this will not cause a wider financial crisis. But the PM thinks having a conversation about how to do this is crazy. The PM’s value judgement is to protect property owners, the modern landed gentry and not to protect the propertyless, the homeless, the generation rent and the future mortgage slaves. I think he is wrong and that this isn’t the kiwi way. I think the time is coming when we will be asked to make a moral judgement on which side we stand for and what sort of country we want New Zealand to become. The PM cannot override the democratic choices of Auckland. Auckland Council has democratically decided that restricting urban growth to the slowest build rate possible and subsidising massive exurban sprawl is the best choice. And yes the council is driving families out of their homes and into the streets as the policy of slow construction inevitably leads to rent rises that the poor cannot afford. I personally do not agree with the policies of Auckland Council, but if we want to change them it is up to Aucklanders. We do not need the government to step in. I would disagree on the basis that this is no longer just an Auckland issue. House prices are going up in Hamilton, Tauranga and other places. These people do not get to vote for the Auckland Council but they have to put up with the Auckland Council’s bad choices. There’s nothing democratic about that. If that’s not a good enough reason for the Government to step in, I don’t know what is. In fact given that people in Hamilton and Tauranga do vote in the general election, the Government has to do something. Like minded neo lib governments seem to get their vote buying scripts from the same source. This largesse of borrowed money courtesy of the taxpayer/ratepayer to keep these creeps in government comes at a very expensive very hidden cost, ask anyone needing elective surgery, any underpaid overworked teacher or financially starved government department employee or anyone getting out of Auckland. As many others have said Keys idiot proposal is all about gifting the developers a free loan from the council paid for by the ratepayers. Quite what it does to solve this housing crisis that isn’t apparently, but is merely a challenge, is a mystery otherwise! Looks to me like a cheeky way to get ratepayers and taxpayers to subsidise developers’ private profits.